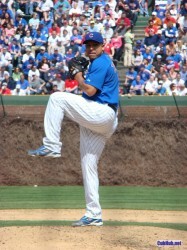 Chicago Cubs pitching ace Carlos Zambrano got his 100th career victory at Cincinnati on Friday. 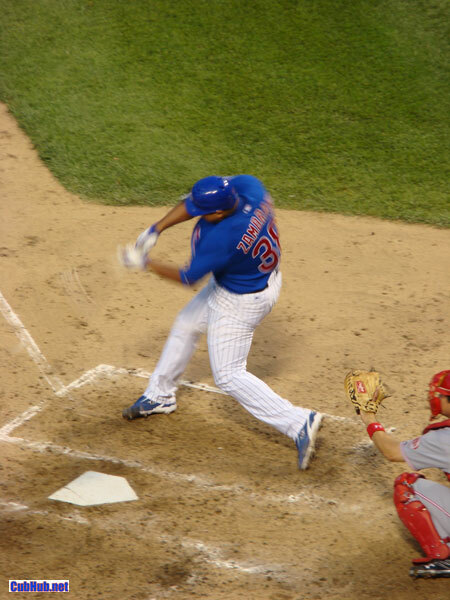 Everything about the game was quintessential Big Z. He was nearly unhittable, but walked 5 in 6 2/3 innings. 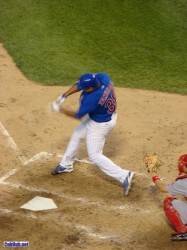 He batted lefty against right handed Reds pitcher Micah Owings and couldn’t catch up to his fastball. So when he came to bat in the fifth, he turned around and batted righty versus righty, crushing the first pitch he saw for a towering home run. His team held on to seal the deal for a 2-1 final score giving Z his 100th career win. After the game, Carlos Zambrano announced he will be retiring from baseball upon the completion of his current contract in “4 or 5 years”. HUH?? I believe this man is an incredibly gifted athelete, but clearly he has some emotional issues. In the past two weeks, he has been tossed from a game, smashed the infamous dugout Gatorade cooler with a bat, and served a six game suspension handed down from the league. Then he was a no-show for the team plane to Atlanta where Z would make his return to the mound following the suspension. With the rain out, next up is Cincinnati where Z notches his 100th career win in the series opener. Followed by his retirement announcement. Carlos cited wanting to spend more time with his kids and seeing his mother on mothers day as reasons why he wants to retire after his contract runs out.